Congratulations to all Young Con students who performed a the Young Con end of the year recitals on 9th and 11th November, and to all the students who performed at the end of the year recital at Theme and Variations on 10th November. You all did incredibly well! Well done to Natasha for playing at the Young Conservatorium Beginners Masterclass with Jenny Flemming on Sat 1st Sept. And well done to Calin for performing at the Young Conservatorium Intermediate Masterclass with Jenny Flemming on Sat 23rd Sept. Calin also took part to the Masterclass with Christopher Norton on the Gold Coast and was invited to perform at the final concert. Congratulations to Ashley/Indigo and Erin/Calin who on 19th August where selected as 2 of the best duos at the Young Conservatorium Duo Masterclass with Max Olding and Pamela Page. The duos were invited to perform at the Australian Piano Duet Festival final concert on 25th August at Theme and Variations. Great job kids!! Well done to the students who performed at the Young Conservatorium Beginners Concert (3rd June) and Intermediate Concert (10th June). On Sat 12th May 17 of my students performed at the mid-year students’ recital at Theme & Variations in Newstead. This concert was particularly special as the students performed on a beautiful Steinway grand piano model D. Everyone performed with confidence and wonderful attention to details. To be repeated!! Last Sunday 29th of April 9 students from Mimia’s private studio and the Young Conservatorium performed at the MTAQ Student Performers Society Concert (Westside). this proved to be a very pleasant occasion where the students showcased their skills in view of their forthcoming exams, Eisteddfods and concerts. Everyone played with lovely poise and musicality. Well done! Well done to the 24 students who took part to the Xmas recital at St Peters Lutheran College on 20th November. The students from my private studio, the Young Conservatorium and St Peters College filled the afternoon with confident performances, which beautifully ended this very busy year. Congratulations to all the Young Conservatorium Beginner and Intermediate students for performing at the End of the Year Recitals on 11th and 13th November. They all did very well and thoroughly enjoyed the occasion. Well done to six of my St Peters students who performed at the School Solo Concert on Sunday 30th Oct. The six performances had excellent presentation as well as accurate memory work. Keep up the great work! Well done to the 11 students who performed for the MTAQ Student Performers Society on Saturday 29th Oct at Massons Music. All performances had confidence, accuracy and beautiful expressivity. Well done to you all! Well done Bianca and Jamie for performing beautifully at the Young Conservatorium master-class given by Jenni Flemming on 3rd Sept.
Beginners programmes performed in two wonderful recitals. All performances showed lots of care to details and musical maturity. Well done to all of them! Well done to all the students who performed at the Mid-Year Piano Recital at St Peters Lutheran College on Sun 29th June. There were lots of very lovely performances and a wonderful audience to support the little (and not so little!) pianists. Thank you to all my students! Well done to Alessio, Anh, Bianca, Zoe, Rebekkah, Thomas, Natasha, Kai, Korin, Kevin and Calin for their great performances at the MTAQ Student Performers Society Concert, last 9th April. The children gave flawless and very musical performances enjoyed by everyone in the audience. On Saturday 27th of November twenty-one students from my private piano studio, St Peters Lutheran College and Young Conservatorium performed at the Christmas Piano Recital at St Peters Lutheran College. The concert went very smoothly, with students offering the enthusiastic audience polished and musical performances, from the little 5 year olds to the more mature students. The occasion made me very proud as a teacher. We are all looking forward to more playing in the new year! Congratulations to my students who performed at the Young Conservatorium’s Beginner Piano Recital and Intermediate Piano Recital last 7th and 14th November respectively. Both concerts were the coronation of the last 6 months’ work and offered all students a very precious performing occasion where they could not only showcase their skills but also enjoy performances by other students. A special mention goes to Natasha, Bianca and Jamie who, as well as mastering solo and 2-piano pieces, worked very hard at their 6-hand Tango which was performed impeccably and passionately. Well done to you all!! Well done to my St Peters students who performed at the St Peters Junior School Solo Performance Concert on 31st October. Everyone performed at their best and all enjoyed the occasion. On Sunday 13th June 2010 twenty of my piano students (private and from the Young Conservatorium) performed at the Mid-Year Piano Recital at the MTAQ auditorium. The (small) venue was packed with people and it was really good to see such good support and participation. The pupils, of different ages and abilities, entertained the audience with several solo pieces, duets, as well a song, mostly performed by memory, with confidence and musical insight. This was the first Student Recital I organized in Brisbane, and I was very glad to see such commitment and enjoyment. Well done to all of you! 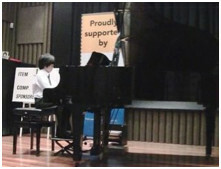 On Sunday 6th of June and on Sunday 16th May 2010 my Young Conservatorium students showcased their skills at the Mid-Year Piano Recital (Ian Hanger Recital Hall, Young Conservatorium). The students replicated their lovely performances from the previous week and managed to keep up the very good standards set in their very first concert. Solo pieces and duet were performed. The pieces were rendered with very good dynamic control, lovely deportment and confidence. Keep up the good work and let’s look forward to the next performance! Congratulations to all my private and Young Conservatorium students who performed at the Student Performers Society 2010 Concert (MTAQ, Southside) on Sun 8th May. Despite this was the very first piano performance for most students, the end results were extremely good. All performers played with confidence, poise, and great musical insight. Well done to you all! Sun 6th Dec 09 - Pupils’ Christmas Performance, at Mimia’s Piano Studio. Thank you to all the new pupils who made this event a wonderfully festive occasion with their lovely performances.